Le retour du Barnum: Blatter, "dictateur à vie" ? Blatter, "dictateur à vie" ? Swiss authorities conducted an extraordinary early-morning operation here Wednesday to arrest several top soccer officials and extradite them to the United States on federal corruption charges. As leaders of FIFA, soccer’s global governing body, gathered for their annual meeting, more than a dozen plain-clothed Swiss law enforcement officials arrived unannounced at the Baur au Lac hotel, an elegant five-star property with views of the Alps and Lake Zurich. They went to the front desk to get keys and proceeded upstairs to the rooms. The arrests were carried out peacefully, with at least two men being ushered out of the hotel without handcuffs. One FIFA official, Eduardo Li of Costa Rica, was led by the authorities from his room to a side-door exit of the hotel. He was allowed to bring his luggage, which was adorned with FIFA logos. The charges allege widespread corruption in FIFA over the past two decades, involving bids for World Cups as well as marketing and broadcast deals, according to three law enforcement officials with direct knowledge of the case. The charges include wire fraud, racketeering and money laundering, and officials said they targeted members of FIFA’s powerful executive committee, which wields enormous power and does its business largely in secret. The inquiry is also a major threat to Sepp Blatter, FIFA’s longtime president who is generally recognized as the most powerful person in sports, though he was not charged. An election, seemingly pre-ordained to give him a fifth term as president, is scheduled for Friday. Prosecutors planned to unseal an indictment against more than 10 officials, not all of whom are in Zurich, law enforcement officials said. Among them are Jeffrey Webb of the Cayman Islands, a vice president of the executive committee; Eugenio Figueredo of Uruguay, who is also an executive committee vice president and until recently was the president of South America’s soccer association; and Jack Warner of Trinidad and Tobago, a former member of the executive committee who has been accused of numerous ethical violations. The Justice Department, the F.B.I. and FIFA did not have any immediate comment. The case is the most significant yet for United States Attorney General Loretta E. Lynch, who took office last month. She previously served as the United States attorney in Brooklyn, where she supervised the FIFA investigation. Ms. Lynch and F.B.I. Director James Comey were expected to hold a news conference on Wednesday morning in New York. Blatter, le président de la Fifa, à un "dictateur à vie"
Diego Maradona n'est pas content et il tient à la dire. Dans un entretien au quotidien britannique The Telegraph, il s'en prend notamment à Sepp Blatter, actuel président de la Fifa. "Nous avons un dictateur à vie" à la tête de la Fifa, affirme l'ancien international argentin. 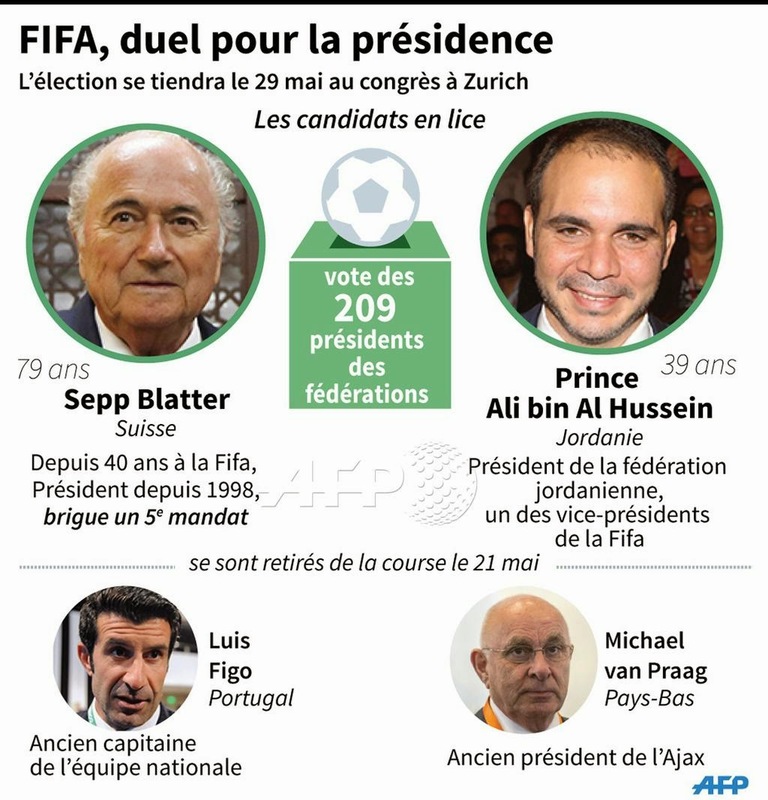 Cette sortie intervient avant l'élection à la tête de la Fifa d'un nouveau président vendredi à Zurich où Sepp Blatter, en poste depuis 1998, part largement favori pour un cinquième mandat devant le prince Ali de Jordanie. Sepp Blatter, 79 ans, se présente pour un inédit cinquième mandat consécutif à la tête de la Fifa. Son seul adversaire est le prince Ali, 39 ans et l'un des sept vice-présidents de l'organisme suprême du football mondial. Mais l'idée de voir Blatter accéder à un nouveau mandat est insupportable à Maradona : "Alors que personne ne soutient ouvertement Blatter, beaucoup pensent qu'il va remporter son cinquième mandat, une absurdité! ", déclare ainsi l'ancien joueur. Si Blatter incarne le visage du football international, alors nous sommes bien mal embarqués", dit Maradona dans l'interview exclusive au Telegraph. Pourquoi une telle déclaration ? "Sous Sepp Blatter, la Fifa est devenue une honte et une douloureuse gêne pour nous autres qui aimons le football", a notamment déclaré Maradona dans son interview publiée lundi 25 mai. "J'appelle Blatter 'l'homme de glace' parce qu'il lui manque l'inspiration et la passion qui constituent le coeur même du football. S'il incarne le visage du football international, alors nous sommes bien mal embarqués", a ajouté Maradona, vainqueur de la Coupe du monde avec l'Argentine en 1986. Mais Diego Maradona n'est pas le seul à afficher son opposition à Sepp Blatter. Dans un entretien au journal l'Equipe, c'est Michel Platini qui dénonce la nouvelle candidature du Suisse. Accusant Sepp Blatter d'avoir "menti" lorsqu'il avait promis de ne pas se représenter, le président de l'UEFA apporte son soutien au prince Ali pour l'élection à la présidence de la Fifa. Putain, ils l'ont fait !